The state’s four Catholic bishops are at the statehouse today, urging legislators to retain a tax credit that helps the state’s Catholic schools. Iowans who donate to a scholarship fund for Catholic elementary and high schools get a tax credit worth 65% of their donation. Dubuque Archbishop Jerome Hanus says reducing that tax credit would be devastating, because it would reduce the number of scholarships that can be awarded. 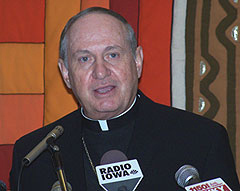 The four bishops issued a statement last April, condeming the Iowa Supreme Court decision which legalized gay marriage in Iowa, saying there is a “clear need” for a constitutional amendment banning gay marriage. Bishop Pates of the Des Moines Diocese says the public’s voice should be heard on this issue. “It’s not only a legal question, but it’s a question of culture,” Pates says. “People should have an opportunity to speak to it. All of the other states in which it’s come up for a vote it’s been very strongly supported, marriage between one man and one woman.” Sioux City Bishop R. Walker Nickless agrees. “I wish we could do something about the marriage amendment and (we) just continue to talk to the legislators about the importance of what we’re doing if we don’t define marriage in the way that God intended it,” Nickless says. “It’s an uphill battle but we’ll keep working on it. I’m certainly with those people who say, ‘Let us vote. '” The bishops, including Nickless are worried about gambling expansion proposals percolating at the statehouse. “We’re a little worried about gambling. You know, is that the only way we can raise funds for the state?” Nickless says. Archbishop Hanus, the top-ranking Catholic official in the state, delivered the opening prayers in the Iowa House and Senate this morning. According to The Iowa Catholic Conference, there are nearly half a million Catholics in Iowa and about 29,000 Iowa students are enrolled in Catholic schools. Iowa has four Catholic dioceses in Iowa, based in Dubuque, Davenport, Des Moines and Sioux City.